Looking to buy a touring or sea kayak? Sea and ocean kayaks are often referred to as touring kayaks, but they are actually a subset of the touring variety. Even though technically, the two categories are not always synonymous, we cover both categories as touring kayaks in this top 10 list of 2018’s best touring and sea kayaks. For reference, we survey customers’ touring kayak reviews and sea kayak reviews from the 2018 Amazon bestsellers list to create this compilation. The 16 foot Ocean Kayak Zest Two Expedition is by far one of the most highly rated touring kayaks according to consumer kayak reviews. Those who have purchased this boat note that the comfortable seating and easy tracking make this a great boat for long expeditions and extended day touring. 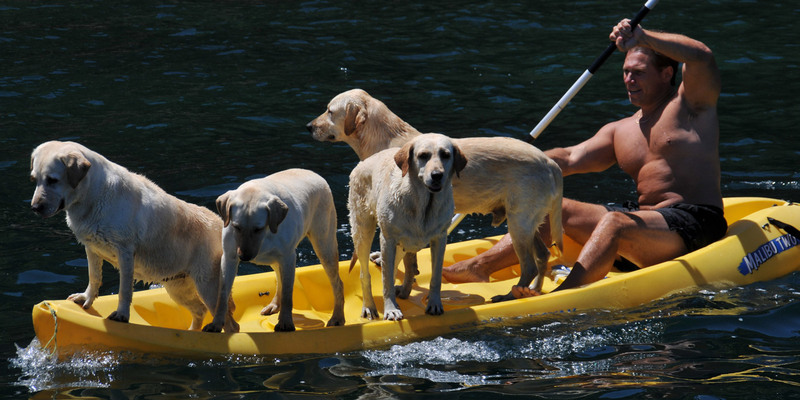 This tandem sit-on-top touring kayak can accommodate two adults and one child, human or canine. Paddlers will find plenty of bow deck storage and other amenities like in-mold cup holders and side mounted paddle holders. Customers report that the Ocean Kayak Zest handles extremely well over waves during warm water sea trips. Though this tandem is designed for two, one person can solo tour in this rig with little effort. One brand name consistently appears in the touring kayak bestsellers lists is Riot Kayaks. According to reviews, customers love the highly rated 14 and 1/2 foot Riot Kayaks Edge as a sea and touring kayak. The boat, though a bit heavier than some outside of the water, travels very fast and tracks very well in the surf. The paddler can adjust the seat and the foot braces for additional comfort during those long treks. The pilot rudder system ensures that you get where you intend to go, and tons of storage makes sure that you have all the gear you need when you get there. The 11 foot Perception Rhythm kayak is another favorite of touring kayakers. Similar to some of the other longer kayaks on the list made for speed and tracking, the Rhythm has a sleek, high-speed design but is less cumbersome because of its 11 foot length. The Enduro is shipped with a deluxe padded seat and foot pegs that are adjustable to find your perfect fit. Carrying handles at the bow and stern will make transporting this kayak in and out of the water a breeze. Customers reviews also report that the Rythm has great tracking and is easy to steer. And don’t feel like you have to keep your valuables at home because there is storage box that fully seals out water right behind the seat. You will surely be looking and feeling good in the Perception Rhythm! 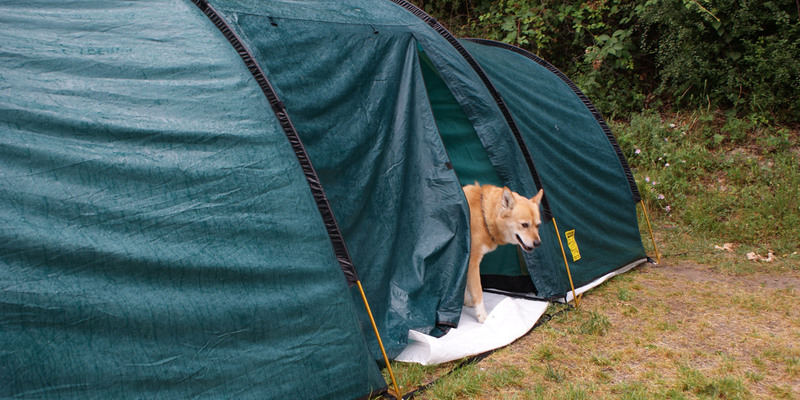 Good luck getting your hands on a 12 and 1/2 foot Wilderness Systems Tsunami 125 because vendors can barely keep this model in stock – it is so popular. Customers love this sit-inside kayak because of its comfort and speed. The overall maximum capacity for this solo kayak is 300 pounds. You will have plenty of storage space for day trips and touring excursions with two hatches and bulkheads in both bow and stern. The boat comes in two colors: Mango and Lime Green. That is, if you can find them in stock! Another Riot Kayaks boat makes the top 10 best touring and sea kayaks list. The 16 and 1/2 foot Riot Kayaks Brittany is a British style sit-in sea kayak that is reveled in its slim profile and smooth maneuverability. The pilot rudder system and retractable skeg make this boat track and turn like a champ. You won’t exert all of your energy keeping this kayak on track, which makes it a good choice for those extended touring trips! The kit includes safety straps, sure grip thigh braces, and a reflective lifeline. If you are looking for a high performance sea kayak, the Brittany will not disappoint. The 10 foot Quest Day Touring Kayak is another highly rated Riot Kayaks favorite for seasoned kayakers and novices alike. This sit-inside touring yak is considerably wider than many of the slim-line sea kayaks, and it is great for leisure cruising and day trips. The Quest is a solo yak with a maximum weight capacity of 250 pounds. Many customers report that this yak’s small size allows them to transport the boat inside a hatchback car by simply folding down one of the car seats. Enjoy solitude on the sea with the Riot Kayaks Quest. For those seeking a lightweight sea kayak with pro-level features, check out the 14 foot Venture Kayaks Islay Light Touring Kayak. You can haul all your necessary gear for your trip in the bow and stern bulkheads and available storage compartments. The ergonomic design of the cockpit keeps you comfortable during long tours, and the paddle park and pod are removable for cleaning and storage. The Islay can accommodate loads up to 286 pounds. The Dagger Kayaks 14 ft. Alchemy sit inside model is sleek, slim and fast. With the proprietary True Track skeg system, the Alchemy tracks like a dream on both rough and sedate waters. The Alchemy is available in two widths. The cockpit of the longer and wider large volume model is perfect for taller, larger adults, while the compact small volume model is perfect for smaller paddlers. You can adjust the seat riser and thigh pads quickly while touring. Coleman One Person Sit-On-Top Touring Kayak are among reviewers’ favorite inflatable kayaks, and one of only two inflatable kayaks in our top 10 list of the best touring and sea kayaks. 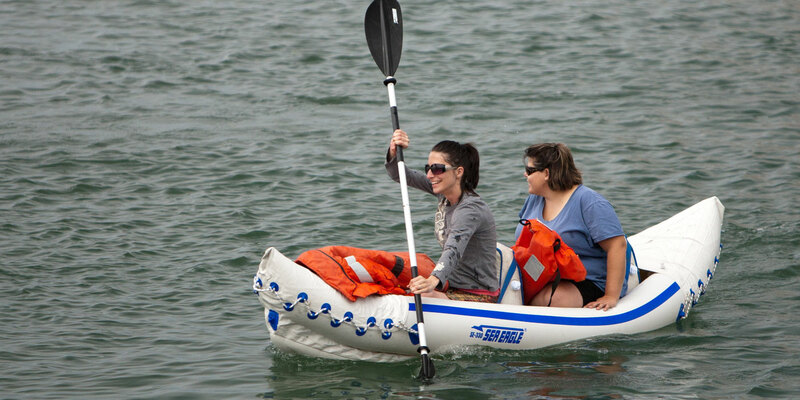 Sit-on-top inflatable kayaks are affordable and designed for comfort on those long explorations. Slide into the soft puffy seat, rest your legs in the leg wells and relax on the cushy arm rests. 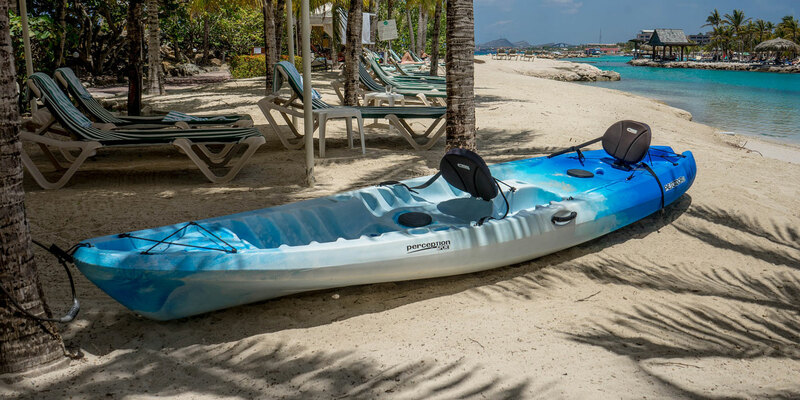 If you prefer to tour solo, these Coleman Sit-on-top inflatable kayaks are portable and easy to carry. The Coleman Touring kayak ships with an 86 inch double paddle aluminum oar. The Sea Eagle New Razorlite is the second of only two inflatable kayaks on our top 10 list. Most popular with reviewers is the Razorlite’s Pro Package, which includes a patch kit, double paddle oar, air pump and carrying case for the boats. The high output pump inflates the boat to 10 PSI in a brief 7 minutes. Though this kayak is an inflatable kayak, the body is slick and slim and has been designed to look like a high-end sea kayak. 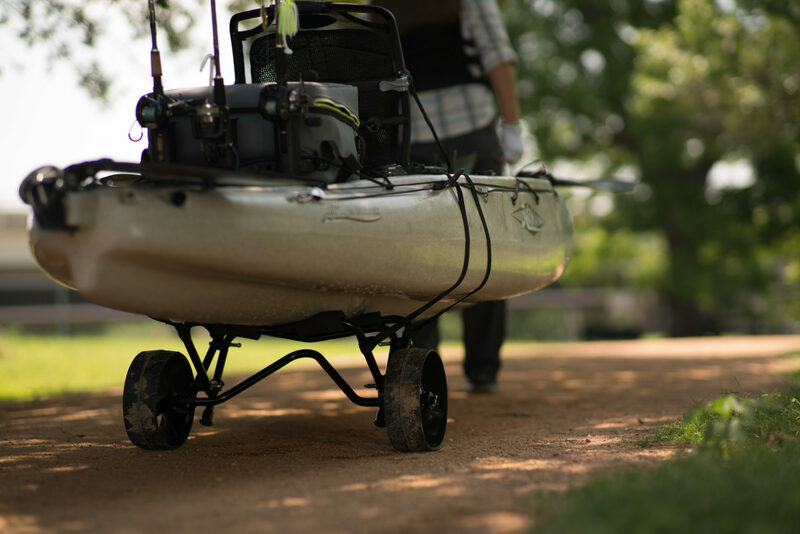 Though the Razorlite weighs only 28 pounds when deflated, this kayak can handle a 500 pound load. Pile on the gear and set off on that long weekend excursion or short day trip with confidence when you’re traveling on the Razorlite. What is a Sea Kayak Used For? Sea kayaks, or touring kayaks, were developed for the sport of paddling while out on open water such as lakes, bays, and oceans. They are smaller boats that feature a covered deck and also allow for the addition of a spray deck. While they may not be recommended for beginning kayakers, touring and sea kayaks are a great choice for the more moderately skilled paddlers with enough strength and skill to be able to maneuver and control the kayak through open water. These boats are also good for those paddlers that do not require a lot of storage area while out on the water for extended periods of time. 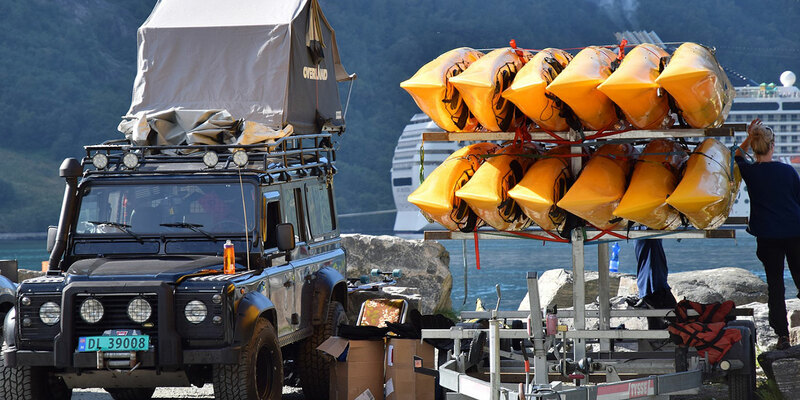 When compared to recreational kayaks, there are a few differences you can note when it comes to sea and touring kayaks. One of the first noticeable features of sea and touring boats would probably be the perimeter lines. Perimeter lines are there to hold onto if there was ever a situation in which you found that the boat was capsizing while you were out kayaking. You can hold onto these lines for safety. The hatches are also different because the hatches on sea and touring kayaks may actually be broken up into different compartments so that if the boat was to fill with water, it would stay floating with enough buoyancy to keep the paddler out of the water. Recreational kayaks tend to sink when they begin to fill with water, so having these extra safety features for a sea and touring kayak can prove useful even in rough and adverse water conditions. The cockpit of a sea and touring kayak may also be much smaller than you can find with a standard recreational kayak. The small cockpit is a feature that will allow the paddler to add the spray skirt if needed for kayaking. Finally, sea and touring kayaks tend to be much longer and narrower than your standard recreational kayak which allows for improved tracking and maneuverability and keeping the boat straight. This design also allows you to move much faster through the water than you would if you were in a recreational kayak. However, you should also keep in mind that this design might be less stable which means you need to make sure you maintain good control and maneuverability of the boat while kayaking, so you stay upright and do not tip.